As a graduate student supervisor, I frequently find myself selling the school-setting to speech-language pathology students. Many graduate programs inadvertently spread the idea that working in the schools is somehow “lesser” or not prestigious. As someone who has worked in schools, clinics, private practice, and hospitals, I find this viewpoint misleading and unfair to the magical world of school-based speech therapy. The school-based setting provides for tremendous opportunities for collaboration between professionals. Not a week goes by when I haven’t met with teachers, the occupational therapist, physical therapist, behavior specialist, autism specialist, and assistive technology specialist. There may be only one speech-language pathologist (SLP) in the school or district, but she is never alone. This last week I participated in several planning and brainstorming meetings to work on ways to improve communication, academics, and behavior for impacted students. “Teamwork makes the dream work” has never been truer than in the school-based setting. Many SLP positions in the schools are flexible. There are frequently part-time and full-time jobs available. SLPs who need part-time work can often “make their own schedule”. I have co-workers who work certain days of the week (e.g. M, Tu, W), or certain hours of the day (e.g. 8:00-1:00). Because of the school calendar, there are frequent breaks during summer, winter, and spring, as well as national holidays. And don’t forget about those surprise snow days for an extra day off! Thanks to the union, most school-based jobs also have a generous sick leave policy. For example, in my job, I am allowed 10 personal sick days per year as well as five family sick days. Those working in other settings rarely have benefits such as these. Most school employees have decent to excellent benefits. Within my district, single and two-person families have all of their medical and dental needs met. Those with families of three or more (such as myself) do end up paying out of pocket, but in exchange, we have excellent coverage. Benefits also include money towards retirement. As long as the system doesn’t collapse within the next 15 years, I will be able to retire with nearly my full pay before the age of 60. At that point, I hope to explore new areas and careers. Because school-based speech therapy is magical, most districts provide autonomy to the SLPs. I am able to create my own goals, materials, and therapy plans. I determine my schedule and groups. For better or worse, administrators usually give me glowing annual reviews because they aren’t quite sure how to evaluate me. The school-based SLP impacts kids in meaningful ways. In my elementary school setting, I have the opportunity to see students frequently, sometimes even daily. I see them in their classroom, the cafeteria, and recess; I observe interactions with peers, teachers, and parents; I witness their good days and their bad days. I watch my students grow from tiny scared Kindergarteners to confident pre-teens. In no other setting will the SLP get to have such an impact on the lives and communication of their clients. After reading through this list, one may wonder why anyone would work in any other setting! Like anything, there are disadvantages to working in the schools. Sometimes, these disadvantages outweigh the benefits. Several times in my career I have explored leaving the schools and going into a different setting. The schools are not a great match for everyone because being a school-based SLP is an intense and never-ending job! There is never a dull moment and rarely a true day off. Although I only “work” 180 days per year, I spend hours after school having meetings. I create curriculum on the weekends and during breaks; I write IEPs on my own time. My job never feels like it is done. Working in the schools may not be a good financial option for some. My school district offers very competitive pay compared to other settings. In fact, I am paid more than some of my hospital-based colleagues. However, high pay is not the case in many districts or states. SLPs with student debts they can hope for government loan forgiveness, but taking a higher paying job is a surer way to pay back loans. Since schools are always lacking in money, even if you have a good salary, you will always be paying for things out of pocket. I pay for many of my materials, toys, and games and receive no reimbursement. Finally, the behavior of students, staff, and even parents can affect SLP job satisfaction significantly. Students with severe behavioral needs still need to receive their speech therapy and case management. Working with students with intense behaviors takes its toll on stress levels. Staff that will not cooperate with the IEP or “play nicely” with services can also make the school-based job frustrating. Finally, the demands of parents can hard. Although most parents are very supportive and thankful for the services that SLPs provide, there will always be some who are unhappy and make that known loudly. There is nothing like a parent threatening litigation to ruin your day/week/year. There are so many great reasons for working in the schools. Every time I am struggling with my setting, I list all the advantages of school-based therapy. At this time in my life, working with amazing colleagues, having a flexible schedule, watching students grow for years, and saving for retirement (not to mention the health needs of my family), makes my decision to stay in the schools easy. Will I ever change settings? I probably will at some point. Because I can retire before age 60, I hope to pursue other settings and paths in the future. I hope to do some teaching at the college or graduate level; I dream of traveling around the country doing presentations; I even sometimes wonder if I will take on a supervisory role. Wherever you decide to work, make sure not to rule out schools. Being a school-based SLP is a fabulous career and might be the perfect choice for you! I love this post! I was surprised to find during my first year of work- just seeing kids’ faces everyday walking in the hallway is a huge benefit. They seem more “comfortable” with me, than when I did my rotation in a clinic in grad school and saw the child 1x or 2x week. There always seems to be a few coworkers that are hard to get along with/never happy, which is a challenge (I’m still learning to not take other peoples’ bad moods personally..)- but I suspect any work setting would have this challenge. One additional thing I’d like to see addressed is the issue of contracting- not every position in the schools is a union direct hire position. Many SLPs have to take contract positions in the schools. This has a few positives, but is mostly more difficult and more unstable. I love working in the schools but contracting really needs to be better included in the discussion of SLPs in the schools. Great point! Hopefully someone who does contract work can chime in on this one! I love being a “school” based SLP. I actually work in the Early Childhood setting (3-5) but I very much consider myself an education based SLP. I love working as a team and with the primary service model. I learn from OTs, PTs and SpEd teachers on a regular basis. I help families support their children at home or at their preschool location. Most importantly my practice and my skills grow on a weekly basis. 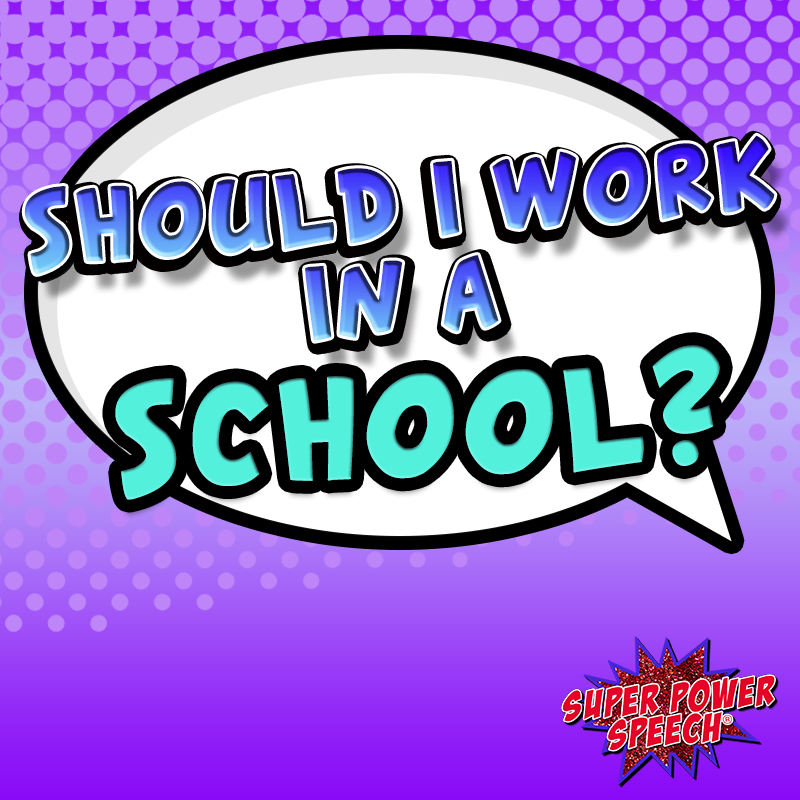 Also I was completely inspired by Super Power Speech to become a school based SLP. The schedule works wonderful for my life, and I fully appreciate the autonomy to provide best services to the children on my caseload in a flexible manner.